Man, the stuff you guys send us as tips are just ridiculous sometimes. I love it. This video is one of my most recent favorites. I don't know the back story behind it, or even where it's from — the LiveLeak page says Russia, but I'm not certain — but all I know is that it's amazing. It speaks the international language of hoonage. 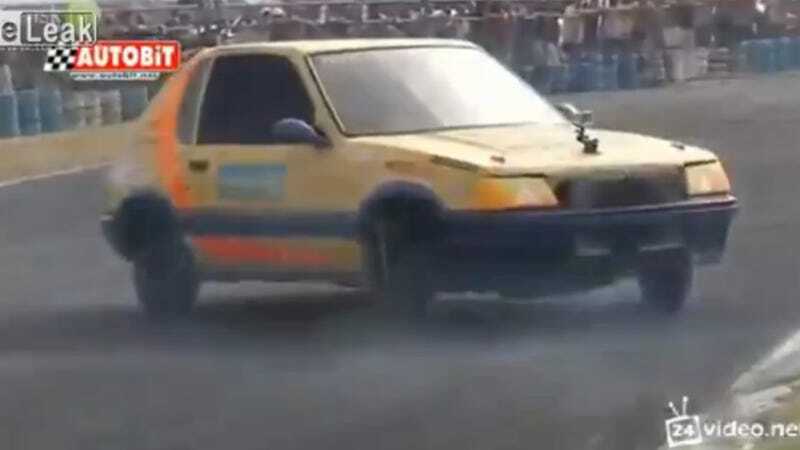 In it we see a Peugeot 205 spin some donuts at what can only be described as "ludicrous speed." It's so fast that the driver staggers a bit when he gets out. I noticed there's a GoPro or something attached to the car. I'd love to get ahold of that video too. Update: As a few of you pointed out, it's Portugese. The driver is Paulo Martinho, and you can check out more of his antics on his website.